Walk shorter stages on the Camino and have fun with the family! Are you looking for an unforgettable adventure and an active holiday with your children? Then read on! We have put together the ideal fun-filled active holiday in Northern Spain with the Camino (Camino del Norte) as the main theme and with fun and exciting experiences for the whole family. 10 days of quality time with your children (or grandchildren) during this active tour along one of the most beautiful coasts in Europe, via the legendary and beautiful Camino del Norte (the coastal route) from Laredo in Cantabria to Llanes in Asturias. The ideal Camino for children / teenagers! We have organised a pilgrimage so that it is engaging for all ages, young or old: with shorter stages, exciting activities along the way, the most wonderful and child-friendly beaches, beautiful hotels (some with swimming pool), delicious food, idyllic coastal towns, unspoiled nature and a two-hour surfing lesson. There are plenty of opportunities to extend the holiday, including a kayak trip on the beautiful Sella river, climbing or canyoning in the mountains, a few nights in Bilbao where the famous Guggenheim museum is located, and much more. Pack your backpack and go on an adventure! In recent years there has been a great demand for family camino travels. We have discovered the ideal stages of the Camino de Santiago, including fun activities and overnight stays in cozy hotels. Walking tour of 91 km divided into short stages of interest for everyone. 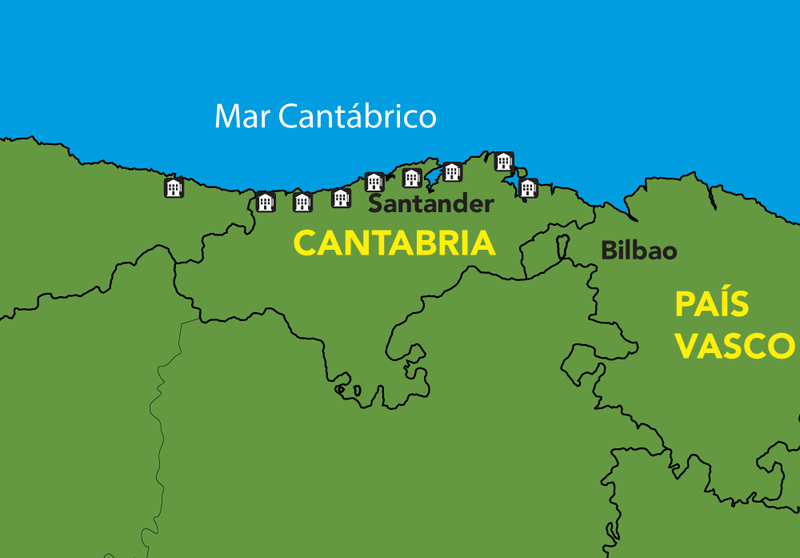 With this Camino trip along the Camino del Norte, you will come along one of the most beautiful coastlines of Spain. Laredo is the ideal starting point for this family trip along the Spanish North Coast, also known as 'the green coast'. Laredo is known for its 4 km long white and child-friendly beach. It is a typical northern Spanish resort with a number of good restaurants, a small old town and a port. In short, a nice start, beautiful city, great beach. If you like seafood, the next day of hiking is a pure gastronomic journey. You travel to Laredo by bus from Bilbao (included in the price p.p.). The bus ride takes 40 minutes. If "4 of the most beautiful beaches in Northern Spain" or "8 km walking with your feet in the water" sounds good, then read on, because this is exactly what you can expect during today's walking stage. First you walk to the end of the famous beach of Laredo where you will take a ferry in the direction of Santoña, this takes about 10 minutes (not included - price 3 € / person - timetable in our guidebook). If you want to make a shorter trip (10km) you can take the ferry directly from the port of Laredo instead of walking on the beach. But it is also possible to walk a longer distance today. Arriving in the bay of Santoña you can make a detour of about 5 km to "El Faro del Caballo". The lighthouse is at a spectacular location along the rocky coast. After Santoña, the journey continues to the next beach, Playa de Berria, which was voted the most beautiful beach in Spain a few years ago. After some time on the beach, you arrive in Noja, this is a wonderful summer resort with delicious food and fantastic beaches. Here you will stay in a hotel close to one of the best beaches in northern Spain, which is also popular for bodysurfing. You can try bodysurf yourself, as long as you book in advance (give us a call if this is desired) or you can stay an extra day in Noja. Today your journey will bring you close to the fields and forests. But, that doesn’t make the trip less interesting. Here you are close to the locals who will greet you. If it is fruit season, you can pick apples and pears. Often your only company along the way are the cows and the horses on the field. You'll spend the night in a beautiful authentically rural environment. Today the route goes back to the coast and the wonderful beaches. The first two stops of today's stage are picturesque 'photo-moment' beaches. When the weather is nice, make sure you arrive before the Spaniards arrive (they usually arrive around noon) and enjoy a few hours between the rocks. Today it takes a bit longer to go to the next beach, but you can take pictures of the beach with its beautiful cliffs, regardless of the weather. From here you go to the coastal town of Somo. This is a mecca for beach and surf lovers. In the summer the city has a lot of ambience and the long beach invites you to walk, enjoy and, of course, surf. In Somo you are greeted by the summer atmosphere; authentic, relaxed and good restaurants. An extra night or two is strongly recommended here, especially in the summer. The day starts with a small ferry trip from Somo to Santander (not included, about 3 € / pers - timetable in our guidebook). Santander (172,000 inhabitants) is an elegant city surrounded by beautiful landscapes. Not far from the center is the peninsula La Magdalena, a fantastic park with large playgrounds, cycling and hiking trails, restaurants, cafes, etc. On a beautiful day this is the place where locals hang out or on Santander's famous beach, El Sardinero. There is time for some sightseeing in Santander. This stage of the camino leaving from Santander is not the most exciting stage and that is why you take a local train today. The train leaves a few times per hour, but because tickets cannot be purchased in advance, we add a roadmap and other practical information about the train ticket in the guidebook that you will receive before departure (ticket price of 3 euro / person). The train ride takes about 30 minutes. Upon arrival, a 6 km walk will take you to one of the most beautiful villages in Spain, Santillana del Mar. Near Santillana del Mar are the famous Altamira caves where 17,000-year-old cave paintings have been discovered. A replica of the caves can be visited and is well worth a visit. The museum is interesting and gives a good insight into human evolution through the millennia. Overnight stay in a cozy and authentic hotel in the old center. After Santillana del Mar you immediately find yourself in a rural settingthat willinfluence your walk along relatively hilly terrainas you walk from one peaceful village to another. On the way, there are many beautiful views, where you can enjoy your picnic. Accommodations are provided in a nice hotel in a small peaceful village close to the rocky coast. A quiet and beautiful walking day on the Camino del Norte along a picturesque coastline full of high cliffs that are occasionally interrupted by beautiful small sandy beaches that invite you for a swim. The tour is easy and goes through a series of small villages where you catch a glimpse of daily Spanish life, far away from the usual touristic areas. There is a lot to see during this stage that ends in the seaside resort of Comillas. Here you can enjoy the old town and the beach. Visit El Capricio designed by Antoni Gaudí, who is best known for his work in Barcelona. Overnight in a nice 3-star hotel in the center of the city. Again, a beautiful and idyllic walking day through one of the most beautiful national parks in Northern Spain, Oyambre. Here you walk with a beautiful view looking out over the coast. Walk a few kilometers through the shallow water of the white beaches. You will have lunch in the pretty fishing village of San Vicente de la Barquera or relax on the beach. No rush, the hotel is waiting in the center of San Vicente, where there is a large choice of restaurants. From the harbor and the viewpoint at the church you have a beautiful view looking out over the coast and the city. Today you take the train again. The train ride takes 30 minutes and you can buy a ticket on the San Vicente de la Barquera Platform (2.85 euro / person). The timetable and map of the location of the station can be found in your Spain is More travel guide. This stage is geologically one of the most interesting stages of the entire camino due to the fact that the next stop is an exciting natural phenomenon known as the 'Bufones'. The experience depends on the weather because on a calm day without waves there is little to see here. What you can normally expect is the water sprayed up through the geyser-like holes when the waves are pushed against the cliffs forcefully. This provides a high-pitched sound and an impressive view. The nature around 'los Bufones' is both beautiful and rugged and is certainly worth a visit, regardless of the weather. There can be a nasty wind, but to see the Bufones in their full glory, the wind is indispensable. Today there is a rest day in Llanes. This is definitely our favorite city on the Spanish North Coast. The beautiful beaches of the city invite you to completely relax. It is possible to take a surfing course here. Tame the blue waves with the help of a surfing instructor. Even if you have never held a surfboard, you will enjoy these hours in the sea. Llanes is one of the finest and most popular seaside resorts on the north coast. It has wonderful beaches, good food, a cozy harbor and a nice old town. The hotel is just a few hundred meters from the center of town and the beach of Llanes. Today you fly back from the airport in Bilbao or another airport. What is included in this trip? 9 nights in cozy and authentic hotels (some hotels have a swimming pool). Spain is More travel guide with maps, suggestions for restaurants, and travel schedules for the train and bus. Maps, guide with directions, recommendations and timetables for trains. * 2-3 pers . : incl. Transport of 2 pieces of luggage of max. 20kg. * 4-5 pers . : incl. Transport of 3 pieces of luggage of max. 20kg. Extra baggage can be booked. ​​​​Train tickets with local train (timetables can be found in the guidebook). Price approx. 8€ / person. In Bilbao, transport between the airport and the bus / train station is not included (about 20€ each way). Make your trip unique with extra nights in Bilbao (Guggenheim) or in Llanes (surfing) or end with a few nights in Madrid (soccer match). 40% deposit at booking. The rest to be paid 30 days prior to departure. We had a brilliant time. A fantastic host made the trip. He said at the start that although we didn’t know each other by the end of the holiday we’d be best of friends, and we were. My son said that even if I wasn’t going again next year, he would. And I really mean it! A very special setup! A high-energy ride and tour de force in the Ria de Arousa. The feeling is very familiar, the touch very personal, the atmosphere very authentic, the nature beautiful, the food great! All together like being on tour with your good friends, who have done everything to impress you. At times almost reaching crazy over-ecstatic heights. 10 hours in the kayak each day (breaks included) combined with overnight stays in dorms and tents drains your energy and your batteries will be low at the end of the week! Happy but tired! Dear Sophia, Thanks a lot for your quick respons and actions. The trip we made is now a wonderfull memory. We have a great story to tell to quite a lot interested perons. We will advise possible bikers or walkers to book their pilgrimage via Spain is More. This for security and service reasons. Hi SIM Team, The trip you organized was just great. I absolutely loved all the hotels you arranged and checking in was never a problem. I did walk the full camino and next year I plan to walk the camino del Norte. Thank you so much - just also want to say that when i walked the Camino - st Francis - 800 kms - the arrangements made were excellent - thank you. Please also thank Rasmus for me. There are not enough great adjectives in any language to say how highly we think of Spain is More. After 16 stages we were having a rough time on the Norte Camino. We learned of Spain is More and contacted them. Within two hours we had a very reasonable price, accommodations for the next night, and a 17 day itinerary getting us to Santiago. General remarks: This was a very well organised trip. Staff at Spain is More were always very helpful and responded to e-mails very quickly. The documentation was good and arrived in good time to be used during my planning before departure. Hotels, baggage transfers and transfer to Sarria: All hotels and baggage arrangements were good. I particularly liked the charming (and helpful) staff at Hostal Casa Benilde in Palas de Rei, the comfortable room and good food at Hotel O Pino (especially the egg & bacon breakfast ! ), and the whole experience at the Hotel in Santiago. The hotel in Santiago was not only ideally placed adjacent to the old part of the city, but very close to Plaza Galicia, from where I had to catch an early bus to return to the airport. The hotel in Arzua was the least comfortable, with no hot water early in the morning and thin walls between rooms. My impression was not helped by the fact that my room overlooked a road building activity, which was noisy and periodically shook the building from 15.00 until 19.30. There were no problems with my taxi from Lavacolla to Sarria and all the baggage transfers were efficient. Excursion to Finisterre: This day trip was excellent. I appreciated the fact that we were a small group (9 people, I think), in a small mini-coach. The guide, Laura, was first class and translated everything into English for my benefit. She also answered all my questions and took the trouble to find additional information for me. We were not rushed at any time, but had 4 stops at interesting places, and saw some nice scenery while travelling. Hi Spain Is More, Thank you for a well planer trip for us in may thi you to Camino Santiago from O'Cebreiro. We had a fantastic trip. And would like to here you suggestion for our next trip. As informed above we walk from O`cebrio to Santiago. We would link assimilation trip before O´Cebreiro. Again fro total 10 days, with 8 days. We would like to end our trip in Santiago de compostello, if it is possible. The trip fra O`cebrio til Santiago should by car. Dear Rasmus and Sophia, One week after my camino finished and I'm gradually coming down to earth. I want to thank you wholeheartedly for organising such an incredible journey and wonderful experience. The range of accommodation was fantastic from the albergue to the one with the spa bath and gigantic beds, all were perfect in their own way. A big thank you too for fixing the accommodation for my husband, both hotels were excellent with lovely helpful staff. Not having to think about flights, tickets, trains made it so easy and relaxing. Dear Team Spain is More, We're back in the Netherlands after a great vacation by Spain is More We want to thank you for the organization of this trip! Everything was we'll arranged. The Hotels were good en we enjoyed the combination of the city Bilbao, Picos de Europa and some days relaxing on the beach. Dear Rasmus, We really enjoyed our Camino Primitivo! Truly a great opportunity and glad we took it! Without your service, we may have had to quit the Camino. Lisa developed very bad blisters on the bottom of her foot. If we had had to carry a full pack and then find an alburque at the end of the day, we probably would not have made it. So we are very thankful for your arrangements! Dear Spain is More Sofia and Rasmus, We are now back in Denmark after a fantastic holiday in Galicia. On behalf of everyone I want to express a Big Thanks you. Thanks for a well arranged and well planned travel package from first contact until back home The tour was great and showed the variety of Galicia added great weather all days The fact that all flight bookings and seat reservation was done is outstanding service No issues at hotel check in and staffing very service minded Great variety of hotels all at high standard and locations Car hiring was perfect and easy The travel book prior to holiday is great and outstanding service So a clear 5 star of 5 from your side. Just got back home after the Camino adventure with Neil Herbert that Spain is More arranged for us. High praise and lots of referrals coming your way. Everything was seamless and perfect and not a single detail was missed. Thank you so much for giving us nothing to worry about except our sore feet! Just returned from a fantastic holiday! We have visited spots, stayed in places and tried things we never would have been able to plan ourselves. We would highlight the mountain trekking in Picos as one of the “peaks” on our holiday. We decided to go all the extra miles, which was given as options on the trip. The views we experienced and the challenges we met was well worth it. 6 ladies from Norway just arrived from Madrid. We have been walking the Camino from Leon to Santiago de Compostela. Started the 31 of August and flew back to Norway the 16 of September. Unforgettable experience for all of us. Age from 75 to 64 ! We come from Stavanger, Bergen, Florø, Ålesund and Trondheim. Love it ! Virginia We wanted to thank you for setting up our Pilgrimage. Everything ,and I mean everything ,came off without a hitch! From the speed train to Leon to the Taxi to the airport in Santiago at 4:30 in the morning. Virginia, thank you for organizing such a great trip. You have exquisite taste in hotels and the more I read the little green book, the more I appreciated all the tips and restaurant suggestions buried in there. It was truly an invaluable resource. Transcantabrico****: 10 days of Luxury Travel through Northern Spain. Transcantabrico****: 7 days of Luxury Travel through Northern Spain. Transcantabrico****: 6 days of Luxury Travel through Northern Spain.